The holidays are looming and while you may be riding a festive high right now, the prospect of flying at this time of year is -- to put it lightly -- daunting for many. Airports are increasingly crowded and all societal rules abandoned within their walls, but it doesn’t have to be that way. It looks like the usual airport slog is getting a little better. 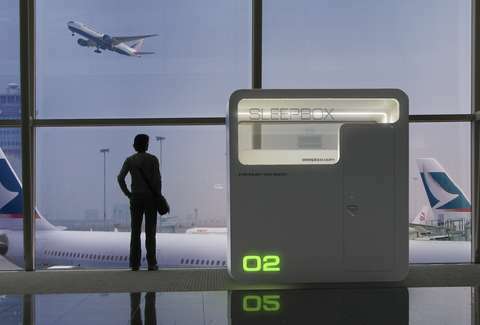 A company called Sleepbox Hotels is hoping to alleviate a little bit of your pre-flight frustration and exhaustion by providing pleasant, private places to rest and re-up your holiday cheer before reaching your destination. And let’s be real… you’ll need it. On December 7, the company is opening its first micro-hotel at Terminal A in Washington Dulles International Airport, equipped with soundproof rooms, memory foam beds, power outlets, and wireless entertainment so you can enjoy a little bit of peace and quiet in an otherwise hectic setting. The only thing missing from this airport oasis are private bathrooms or showers for patrons, and maybe a minibar. Still, it beats trying to catch a quick nap on the floor (noise cancelling headphones can only do so much) or booking a whole room at a nearby hotel. Travelers can take their pick of two room sizes: a compact suite, which is about 30 square feet with eight-foot ceilings, or a “standard” room, which clocks in at 45 square feet. Sleepbox Hotels’ Washington Dulles location will feature 16 rooms and you don’t even have to talk to anyone to book one. If you happen to be passing through Washington Dulles International Airport on your way out of town, you can download the Sleepbox Hotels app and book a room for an hourly rate. Stuck there on a nightmarishly long layover? You can book one of Sleepbox’s rooms for up to 12 full hours. The app also unlocks the room and controls its features, so you won’t have to worry about anyone getting in between you and your much-needed z’s. Sweet dreams, brave holiday travelers.